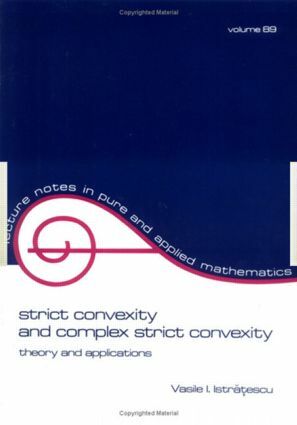 This important work provides a comprehensive overview of the properties of Banachspaces related to strict convexity and a survey of significant applications-uniting a wealthof information previously scattered throughout the mathematical literature in a well-organized,accessible format.After introducing the subject through a discussion of the basic results of linear functionalanalysis, this unique book proceeds to investigate the characteristics of strictly convexspaces and related classes, including uniformly convex spaces, and examine important applicationsregarding approximation theory and fixed point theory. Following this extensivetreatment, the book discusses complex strictly convex spaces and related spaces- alsowith applications. Complete, clearly elucidated proofs accompany results throughout thebook, and ample references are provided to aid further research of the subject.Strict Convexity and Complex Strict Convexity is essential fot mathematicians and studentsinterested in geometric theory of Banach spaces and applications to approximationtheory and fixed point theory, and is of great value to engineers working in optimizationstudies. In addition, this volume serves as an excellent text for a graduate course inGeometric Theory of Banach Spaces.